For years I have worked to come to terms with the fact that I have Obsessive Compulsive Disorder: Sadly mine does not manifest in the need to clean (hence my disaster of a house), but mine causes me to fixate unrelentingly on something and think about it morning, noon, and night – to almost unhealthy levels. Sometimes the obsessive tendencies stay for many years, sometimes they go away in short order. But, even when a compulsion fades away, another is usually in the wings and swoops in to take its place. When I was growing up, my mother referred to these “episodes” as “phases” or “fads;” it was only when I got older and started to understand more that I realized that it wasn’t just a passing fad…people don’t get that obsessed over fads as much as I do – to the exclusion of almost everything else. However, it has struck this level of mania with crochet as it has at other points in my life. 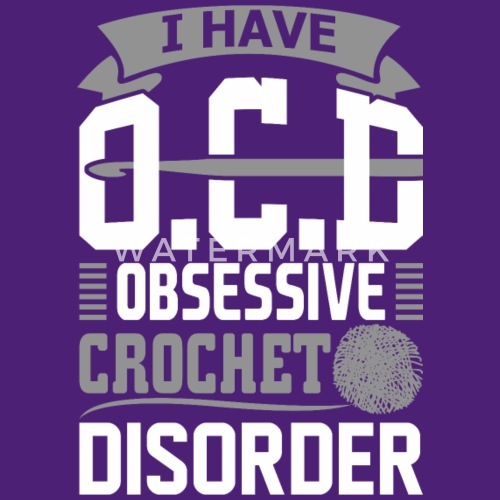 The ironic thing is there is a term in the crochet community that people say they have OCD – “Obsessive Crochet Disorder,” where they have a desire to eat, talk, sleep, work crochet. When they aren’t practicing the art, they are thinking about it. But what happens when Obsessive Compulsive Disorder meets Obsessive Crochet Disorder? In my case? Pretty much no focus for anything else. I am feeling under the weather today, so I went through and organized my patterns that I save on my Google drive. I have so many patterns, it is impossible to believe I will be able to ever make one of every pattern. Yet, I find myself skulking on Etsy to see if there are any new patterns that have been released that I can use. The same is true with my yarn stash. I have tons of yarn – more than I could use in a year….but, it always seems like there is a sale or something else that is going on that I need to get at least one more skein – maybe it is for a pattern that I need a specific color I don’t have, or maybe it is just that a sale is too good to pass up. I do worry that if this is a more manic episode with my compulsions that in a year or so I will stop crocheting altogether and then end up with tons of money poured into something that I now have no use for. I also worry that I will end up with raw materials that I won’t use because I have given up. Even though I can identify with my rational mind that I don’t need something or that I don’t need it now or that I need to wait until I use some of what I already have – there’s that voice that niggles me from the back of my head that says – do it! You don’t know if you will be able to find this again. Sometimes I can quiet the voice and walk away and content myself with what I have. Other times there is no turning back and the voice won’t go away, no matter what I do, and it won’t be happy until I buy my new yarn, or new hook, or more safety eyes. For the time being, the other OCD, obsessive crochet disorder, is moving at full steam ahead, too. I get so much joy and relaxation out of what I’m making – even if the project doesn’t turn out exactly the way that I want. But, the cynic in me – the one who is cognizant of the manias that I have gone through and what is left in the wake – worries. All is good now – almost 2 years in – but what happens in six months, a year? What happens if I wake up tomorrow and decide that I never want to crochet anything ever again? At this time I can’t imagine it, but I also know it is a real possibility and it is only the compulsion that keeps me moving. It is definitely an interesting conundrum. It is one that keeps me up thinking at night – which I’m sure is not good for the obsessive in me. For now, I am trying to just hang on and enjoy the ride and try to tamp down on the more obsessive moments of my compulsion; and, I’m also trying to learn to not be too hard on myself in those moments that my compulsion takes over and try to do better the next time. At the end of the day, I guess that is all we can do; work to be our best selves and to handle situations better than we have previously. It will be interesting to see the convergence of these two and see which, if either, comes out on top.